Grodan stonewool is known for its quality, consistency and performance. 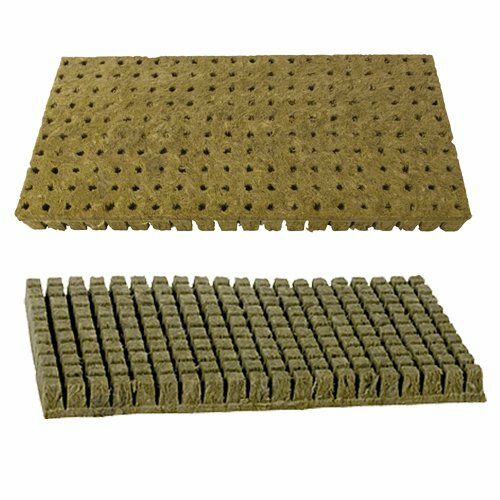 Each sheet of Grodan Stonewool A-OK Starter Plugs is perfectly-sized to fit a standard flat and each plug has a pre-formed hole to easily plant seeds and cuttings. Once rooted, gardeners can transfer individual A-OK Starter Plugs to larger pieces of stonewool or plant them directly in soil. Grodan's A-OK Starter Cubes come with a pre-made planting hole which easily allows you to place cuttings, seeds etc into the cubes for fast, easy rooting and sprouting. Once roots develop you can easily separate the cubes and transplant using whatever method you prefer. In order to be more cost efficient, the sheet of 200 cubes may be packaged in 2 sets of 100 cubes. If you have any questions about this product by Grodan, contact us by completing and submitting the form below. If you are looking for a specif part number, please include it with your message. Windowsill Herb Garden Kit, Herb Planter Comes Complete with a 10 Variety Non GMO Heirloom Herb Seed Collection & Herb Pots.